The question of the week is why do I not feel any baby movement yet?? I realize that I am still within the normal window of time to start feeling movement but I felt all my other babies weeks earlier than this. Even Levi, who had an anterior placenta. 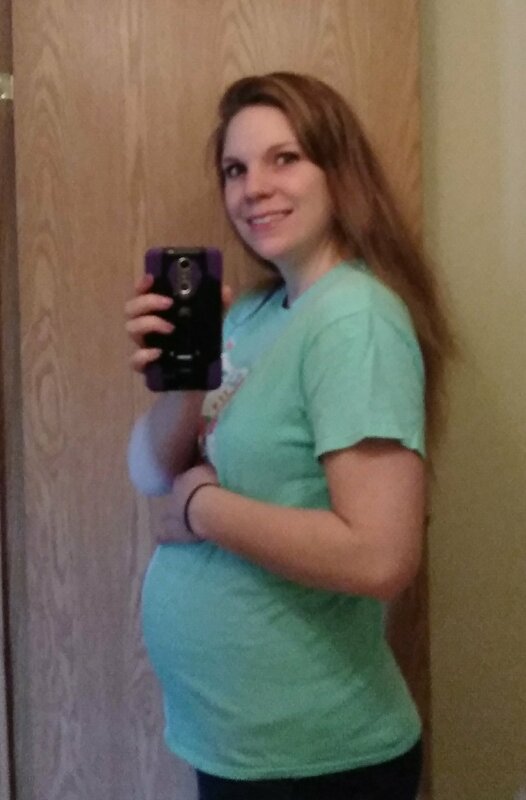 I am pretty sure I felt some flutters with this baby around week 15 but I’m definitely not feeling anything now. I’ve tried laying still and quiet and just focusing and I’ve tried listening with the doppler to see if I hear movement. Granted, I’m heavier this time around and listening with the doppler isn’t hugely helpful with hearing kicks. All I know is I am glad the anatomy scan is scheduled for next week and I hope I’ll see lots of kicks then. Hopefully I’ll start feeling movement soon! It’s seriously the best part of pregnancy and I feel so anxious to start feeling it. One thing that I’m very happy about is that the morning sickness is FINALLY gone! I still get occasional surges of queasiness but nothing at all like before. I woke up this morning feeling no nausea and just felt a rush of thankfulness to be done with that part of pregnancy. I’m feeling some Braxton Hicks lately which is not at all unusual for me by now. I can’t believe I am already having SPD pain. It seems this usually starts a lot later on for me. Some days it’s not too bad and then other days I’m hobbling around. I think it primarily flairs up from how I sleep. If I could just figure out how I’m sleeping that is causing it to hurt worse…. And a random tidbit, I can feel my uterus right below my belly button. My belly is definitely rounding out and taking on more of the basketball shape. I’m still wearing my regular clothes except for my one pair of maternity jeggings I bought several weeks ago. I need to pull out my maternity shirts though as my regular shirts are getting short. I’ve gained almost 9 whole pounds already. 😩 Not thrilled about that but it is what it is. I’ve also gone up a cup size and have been super sore up top the last couple weeks. They feel so heavy and solid. It’s crazy how my body knows what to do and is going through all the changes like an old pro. Still having days were I’m completely exhausted and can fall asleep at the drop of a hat. Hopefully my energy level will improve a bit soon. I have so much to do around here now that the weather is getting better! Dear God, I’d just love to feel this little baby moving around in there soon. Thank You for his beautiful little life. Please protect him and help him be strong and healthy. In Jesus’ name, amen.